With David away for the week I have to confess that I'm scrapping around trying to find interesting things to tell you. So today I'm going to tell you about a method that can guarantee you betting profits and then after I've explained that I'll tell you how you can make just as much profit with less than half the work, with a but. The but is that the much easier method doesn't guarantee profit on every bet, but (again) you are guaranteed to profit over the long run and as I say it's a lot easier. What I'm talking about is betting those each-way bets where, because the bookies are locked into 1/5 or 1/4 odds, that the place odds are much larger than they should be. Before I hand you over to Steve, I wanted to make sure that you grabbed your copy of the Cash Chaser system. This is a pretty straightforward system that picks runners in Chases based on top jockeys. 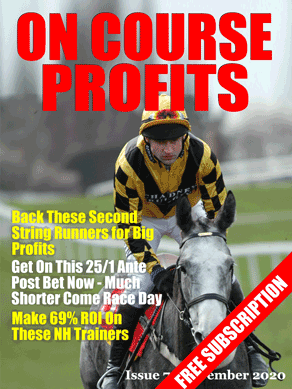 It comes with full results back to 2011 and has shown a 32% ROI and a 30% strike rate. Before I hand you over to Steve for his run through of this weekends bonuses I just want to make sure you know about the freebies available from Cleeve Racing. The Cleeve 10 to follow list produced 28 points profit last year and they are hoping to better that with thise years product. At the time of writing the weekend is looking fairly quiet but I think it’s a case of the quiet before the storm. There will be plenty of action for us all on Saturday’s Channel 4 Racing. If you want to get more of a flavour of what we do in Clear Bonus Profits, then take a look at the fantastic explainer video we’ve created on the homepage to make things crystal clear. £50 Free Bet – Bet365 – Back any single winner at 4/1 or more on any race televised live on feature race and you can have a risk free bet to the same stake (up to £50*) on the next live feature race. £25 Free Bets – Coral- Back any single winner at 2/1 or more on any race a Romford on Friday 21st October and get your winnings and a £25 free bet to use on the following days greyhound racing. Random Bonus – Coral – Place a bet of £/€10+ on any market of the below matches between now and kick off on the 23rd October and qualify for a Casino Bonus ranging from £/€2 – £/€100. £2 Free Bets – Bwin – Bet £20 pre-match on the Half-time/Full-time market in the selected Saturday game and receive a £2 free bet for every goal scored. £5 Free Bets – Red Bet- All you need to do to take part is to make a pre-match single bet of €25 in the selected Goal Bonus match and then for every goal scored by the selected Goal Bonus team; you will receive a €5 bonus. £1 Free Bets – Genting – Bournemouth v Tottenham – Place a £10 pre-match bet at odds of 1.50 or greater on any of the eligible markets (Match Result (1X2), Correct Score, First Goalscorer, Half-Time/Full Time). For every goal scored you will receive a £1 free bet. £25 Refund – Boyle Sports – Bet £25 on selected games and if your bet loses and either team hits the crossbar you’ll receive your money back as a free bet. >>>It’s worth noting that within Clear Bonus Profits we give exact instructions and training videos showing you exactly how to place bets on these for minimal risk and maximum gain. Wishing you a profitable week ahead!